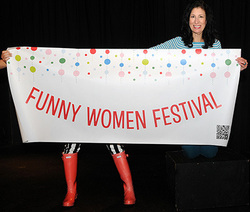 Launching Victoria’s first Funny Women Festival, a chance to host professional female comics from across western Canada, while highlighting the women of Victoria’s burgeoning comedy community. It’s a scene Van Ritzen has played a key role in building since she moved to Victoria with her partner Ian Ferguson in 2010. At that time there were just two monthly shows open to amateurs. Some of those former students were among the 32 emerging and established female performers she worked with last year as executive producer of She Kills Me, a 13-episode series of comedy specials now airing on Aboriginal Peoples Television Network. The series was taped in front of a live studio audience over five days at The Metro Theatre last February and featured Van Ritzen as host. shows could be recorded for television or radio. The possibility of a conference or set of workshops is also appealing – so is the idea behind this year’s networking brunch – and underscores Van Ritzen’s hopes to secure sponsorship in years to come. Her initial motivation behind both projects was to provide more opportunities for women in a typically male-dominated arena. Asking why festival organizers tend to book just one or two women alongside a lineup of men, when women in comedy have never been stronger, is a question Van Ritzen is willing to pose. But she prefers to answer it with action. the show from fellow performer Karen Brelsford.